When making a picture of someone, there are many ways to draw attention to your subject. One common technique is to use a shallow depth of field to blur the background or foreground. Another option is what photographer Frederic Vasquez did here using a slow shutter speed to create a whir of activity around the stationary police officer. Yet, knowing how to get the shot and having a vision of what you want is just half the battle. As with a lot of great street photography, you also need patience and a little bit of luck. For this picture to happen, Frederic had to catch the policeman standing motionless. If the officer had turned his head during the 1/8th of a second that the shutter was open, the officer's face would have been blurred and the moment would have been ruined. But that's not all. The passengers exiting and entering the train had to be spaced out so that they didn't obstruct the view of our friendly Tokyo subway officer. Not an easy task during rush hour at Shinjuku Station, where some 3 million people pass in, out and through the station each day. As it happened, framing the officer between two blurred commuters worked perfectly. Even better was the fact that the officer is positioned between the two subway windows, which give the neat effect of serving as pictures within the picture. Frederic, an amateur photographer who grew up in France but now lives in Aberdeenshire, Scotland, says when he arrived at Shinjuku Station, the scene could be described as organized chaos. His attention was immediately drawn to the officer, who was in the center of the madness making sure everything moved smoothly. Frederic watched and took note of the patterns. Then he waited. He knew the moment would eventually come with passengers disembarking and the officer standing perfectly still. 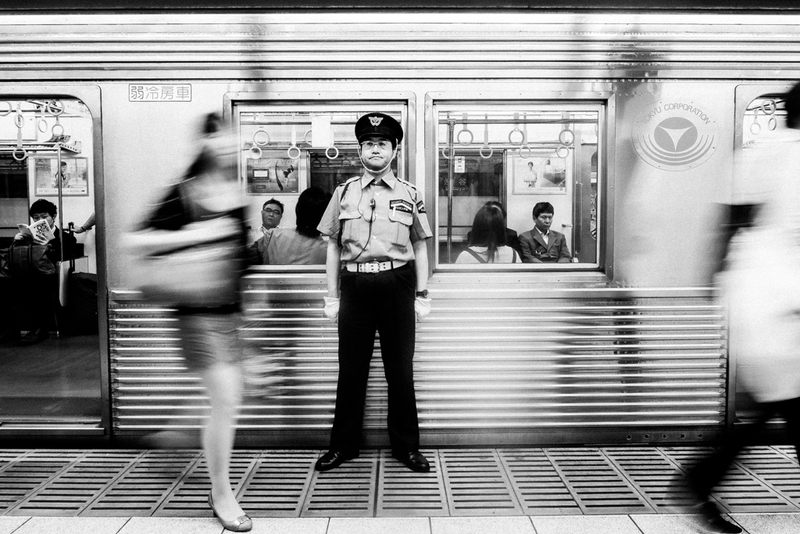 The shutter speed on his Olympus E-M10 was slow enough to get the blurred movement Frederic wanted while seemingly "freezing the guard in time." It helped that the Olympus has built-in image stabilization that made it possible to hand hold the E-M10 at such a slow shutter speed. The resulting image is wonderful. I love the composition and the expression on the officer's face. Frederic says the five days he spent in Tokyo were an amazing, eye-opening experience. He spent 16 to 18 hours a day wandering around taking pictures. "My trip to Tokyo was decided at the spur of the moment -- a last-minute need to get away and shoot in a different place," Frederic says. "I looked at the map, checked with the airline, and Tokyo it was." Several of the photos from his trip to Japan are featured on the Italian Vogue website. When asked to describe his work, he said he considers it a mix of street photography and "social documentation." The distinction, Frederic says, being that social documentation is more about showing the human condition in a specific environment relative to a certain time period, whereas street photography is often timeless and more focused on the photograph as art. "I really like getting close to people and showing their facial expressions -- capturing an emotional response to the camera or the mood they are in that day," Frederic says. It doesn't always go well. He's had a few people threaten him or yell at him for taking their picture. "But it makes a great story to tell and some people you meet are truly amazing." Image of Tokyo police officer by Frederic Vasquez. It is used here with permission. You can see more of Frederic's work here. A version of this article was posted at Cosmic Smudge.